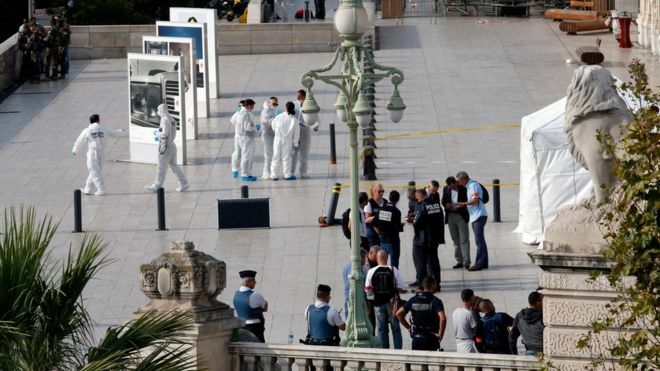 A suspected jihadist who stabbed two young women to death at Marseille's main train station had used several aliases and was a known petty criminal, French police and officials say. A soldier shot and killed the attacker after the stabbings on Sunday. The victims were cousins from Lyon, both aged 20. The knifeman had been detained in Lyon on Friday on suspicion of shoplifting, but then released for lack of evidence. He struck just outside the station. The man was said to be of North African appearance, but his identity remains unclear. A police source quoted by Le Parisien newspaper said "he had the profile of a petty criminal, and in order to deport him it would be necessary to identify him, and that did not take place". Witnesses said he shouted "Allahu akbar" (God is greatest) during the attack, by a bench outside the southern city's Saint Charles station. So-called Islamic State (IS) said the attacker was one of its "soldiers". Since January 2015 France has suffered a spate of jihadist attacks that have claimed more than 240 lives in total. Paris public prosecutor Francois Molins, quoted by Reuters news agency, said the killer had seven different identities, none of which were on French anti-terrorist checklists.